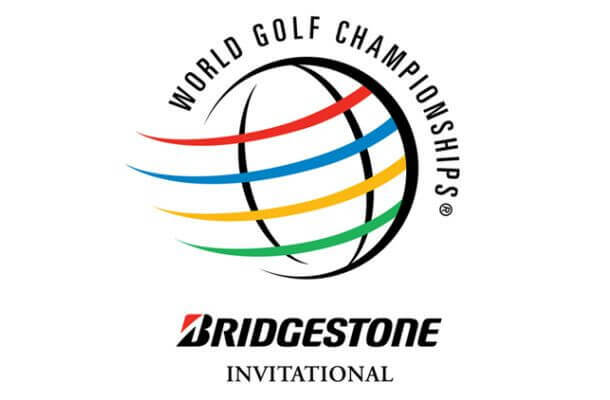 It’s a busy week in golf with the Barracuda Championship, WGC Bridgstone Invitational and Open De France. 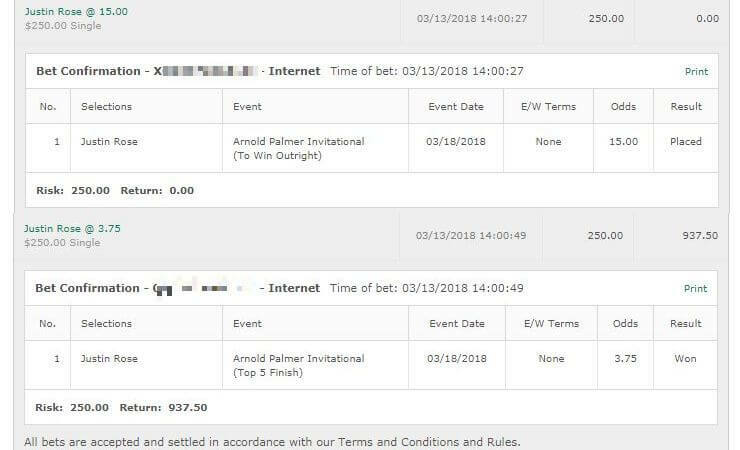 I’m feeling a little bit swamped this week with a lot of work on my plate and I’m a bit overwhelmed with all the tournaments plus the LPGA that I’ve looked at so I want to warn you guys that we’re going to take it with smaller bets this week. I’m not feeling as confident as I usually am – basically I feel like I could have put more work into it this week and while I like my picks – I’d recommend small bets of a quarter unit on each one. It’s always a big achievement to win this one and J.J. Henry will be hoping to pick up another huge win. There’s just something about this course that really brings out the best in him. Course history can be fairly big here actually. I’m going to take Brendan Steele to win & E/W at 12/1. He’s always performed well here although his inability to crack the Top 5 is a cause for concern. He’s been treading water lately though and I think he’s up for a big score on a course he is familiar with and has played very well on in the past. Same bet on Martin Laird who really hasn’t been impressive lately but I can’t ignore his form on this course. It’s really suited for him. And the same on Robert Garrigus who has had some impressive finishes lately like the 4th place at the Byron and 8th place at the QuickLoans and really just looks like he is having the time of his life out there right now. Love seeing him play. This should be quite a good event and I’m looking forward to it. It’s one of the toughest courses and I love that 16th hole par 5 – just a beast that one. Even Happy Gilmore would struggle on that one. To win and E/W on Jim Furyk who historically has been fantastic on this course with multiple top 5 finishes and quite a few top 10 finishes too. The competition isn’t as hefty with Rory not playing and Spieth off his game. Jason Day looks a bit iffy too and I think DJ is due for a downswing now. I’m also on Justin Rose. He had a shocking performance at the US Open but it wasn’t so long ago he was 3rd at the Wells Fargo and had a -5 at the Players Championship and I could see him throwing in a nice performance here. That’s the only tips for the WGC. Rory is the favourite for this one. He hasn’t played here since 2010 when he came 4th. Not a fan of his price though. 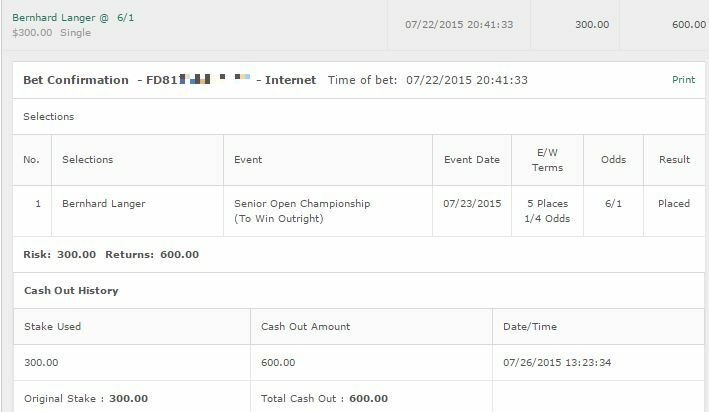 I’m taking Kaymer to win & E/W. He’s performed well here in the past and he’s had some solid form lately that I’ve been impressed by. I’m taking Robert Dinwiddie who even though hasn’t performed well here is on some nice form lately and who knows. I always like seeing a golfer on a hot run and he’s doing just that. Finally I’m on James Morrison. On Austin Ernst to win & E/W based on her course history here. Also Candie Kung who performed well here last year and I think might just surprise us. 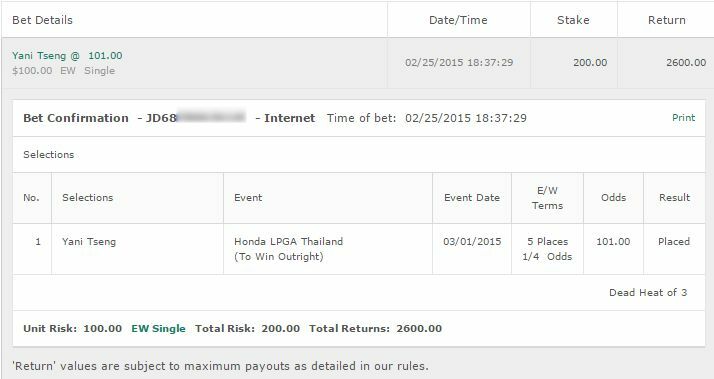 As you can see not really many detailed write-ups this week and as recommended – all small bets.